Our report on political polarization in America has renewed debate among journalists and academics over what is called “asymmetrical polarization” – the idea that one party has moved further ideologically than the other. A number of congressional scholars have concluded that the widening partisan gap in Congress is attributable mostly to a rightward shift among Republican lawmakers. But what about the public? Have Republicans nationwide shifted further than Democrats over the past two decades? The report addresses this issue in considerable detail. What we find is clear evidence of more ideologically consistent thinking on both sides of the spectrum, as well as greater levels of partisan antipathy, though the latter is currently more acute on the right than on the left. Ideological consistency. Currently, 23% of Democrats have liberal views across nearly all items on a 10-item political values scale, while another 33% have mostly liberal views. Among Republicans, comparable shares have either consistently conservative (20%) or mostly conservative (33%) attitudes. In both parties, the shares expressing mostly ideological views have increased, but in very different ways. The percentage of Democrats who are liberal on all or most value dimensions has nearly doubled from just 30% in 1994 to 56% today. The share who are consistently liberal has quadrupled from just 5% to 23% over the past 20 years. In absolute terms, the ideological shift among Republicans has been more modest. In 1994, 45% of Republicans were right-of-center, with 13% consistently conservative. Those figures are up to 53% and 20% today. Since 2004, Republicans have veered sharply back to the right on all of these dimensions, and the GOP ideological shift over the past decade has matched, if not exceeded, the rate at which Democrats have become more liberal. Partisan Antipathy. Among members of both parties, the shares who express very unfavorable opinions of the opposing party have approximately doubled since 1994. Today, 43% of Republicans have a highly negative opinion of the Democratic Party, while nearly as many Democrats (38%) feel very unfavorably toward the GOP. Even so, today there is greater partisan antipathy on the right than the left. In the current survey, we asked those who had a very unfavorable opinion of the opposing party: Would you say that party’s policies “are so misguided that they threaten the nation’s well-being, or wouldn’t you go that far?” Among Democrats, 27% go so far as to say the GOP is a threat to the well-being of the country. 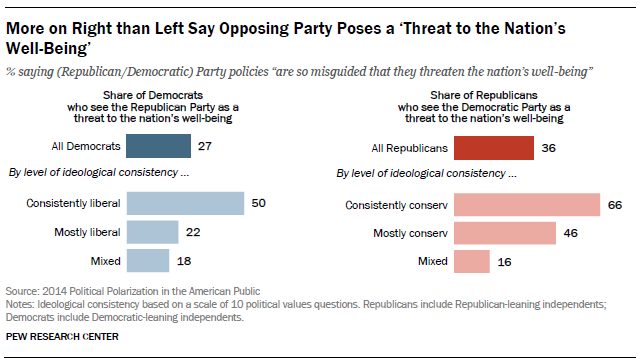 A higher percentage of Republicans (36%) say Democratic policies threaten the nation. The disparity is much larger when ideology is factored in. Among consistently conservative Republicans, 66% regard Democratic policies as a threat to the nation’s well-being. 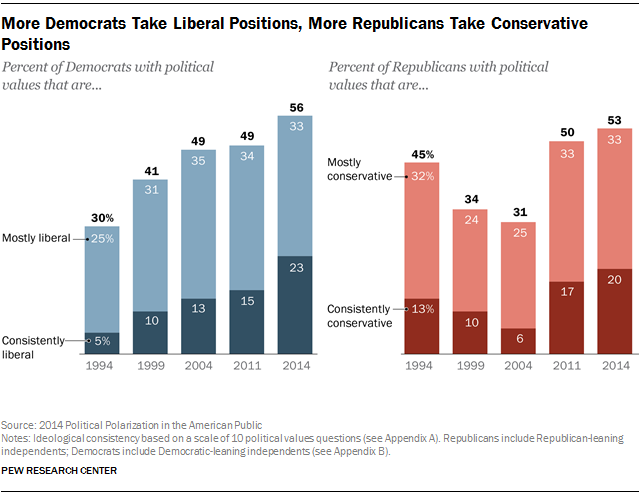 Substantially fewer (50%) of consistently liberal Democrats think Republican policies represent a threat to the nation. One caveat: There is no trend on the “threat” question. Other data show that Republicans are intensely opposed to the Obama presidency, which is likely a factor in their highly negative opinions of the Democratic Party. At a comparable point in George W. Bush’s second term, negative views of Bush among Democrats were on par with negative opinions of Obama among Republicans today. But it is not possible to determine the depth of Democratic antipathy toward the GOP at that time. The Personal Side of Polarization. Among the questions we have gotten on polarization is this: If Republicans and Democrats increasingly view the opposing party in highly negative terms, do they also view each other more negatively? Comparably small shares in both parties – 15% of Democrats and 17% of Republicans – say they would be unhappy if a family member married someone from the opposing party. Even among consistent conservatives and liberals, the numbers who would have angst over a family marriage to a someone from the “other” party are not very large (30% of consistent conservatives, 23% of consistent liberals). Yet on another dimension of personal polarization – having friends who generally share your politics – consistent conservatives stand out. Fully 63% of consistent conservatives say most of their close friends share their political views, compared with 49% of consistent liberals. 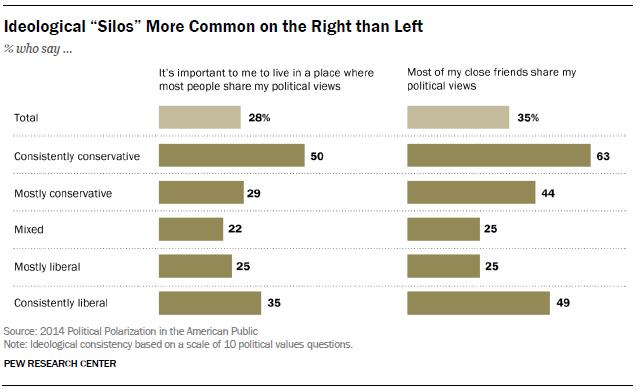 Moreover, far more on the right (50%) than left (35%) say it is important to live in a place where most people share their political views. While these “ideological silos” are more common on the right than the left, what is equally striking is how little it matters for those with a mix of liberal and conservative views. Just 25% of those with mixed ideological views say most of their friends share their views and just 22% say it is important to live in a community where most share their views.